The term "strategy" comes ultimately from Greek, (στρατηγια or strategia) meaning generalship. It differs from "tactics" in that it refers to the general scheme of things, whereas "tactics" refers to organization and execution. In abstract strategy games, the game is only loosely tied to a thematic concept, if at all. The rules do not attempt to simulate reality, but rather serve the internal logic of the game. A purist's definition of an abstract strategy game requires that it cannot have random elements or hidden information. This definition includes such games as chess, Go and Arimaa (a game with multiple moves within a turn). 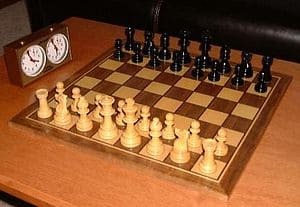 However, many games are commonly classed as abstract strategy games which do not meet these criteria: games such as backgammon, Octiles, Can't Stop, Sequence and Mentalis have all been described as "abstract strategy" games despite having a chance element. A smaller category of non-perfect abstract strategy games incorporate hidden information without using any random elements; for example, Stratego. One of the most focused team strategy games is contract bridge. This card game consists of two teams of two players, whose offensive and defensive skills are continually in flux as the game's dynamic progresses. Some argue that the benefits of playing this team strategy card game extend to those skills and strategies used in business and that the playing of these games help to automate strategic awareness. Eurogames, or German-style boardgames, are a relatively new genre that sit between abstract strategy games and simulation games. They generally have simple rules, short to medium playing times, indirect player interaction and abstract physical components. The games emphasize strategy, play down chance and conflict, lean towards economic rather than military themes, and usually keep all the players in the game until it ends. This type of game is an attempt to simulate the decisions and processes inherent to some real-world situation. Most of the rules are chosen to reflect what the real-world consequences would be of each player action and decision. Abstract games cannot be completely divided from simulations and so games can be thought of as existing on a continuum of almost pure abstraction (like Abalone) to almost pure simulation (like Strat-o-Matic Baseball). Wargames are simulations of military battles, campaigns or entire wars. Players will have to consider situations that are analogous to the situations faced by leaders of historical battles. As such, war games are usually heavy on simulation elements, and while they are all "strategy games", they can also be "strategic" or "tactical" in the military jargon sense. Traditionally, wargames have been played either with miniatures, using physical models of detailed terrain and miniature representations of people and equipment to depict the game state; or on a board, which commonly uses cardboard counters on a hex map. Popular miniature wargames include Warhammer 40,000 or its fantasy counterpart Warhammer Fantasy. Popular strategic board wargames include Risk, Axis and Allies, Diplomacy, and Paths of Glory. Advanced Squad Leader is a successful tactical scale wargame. Strategy video games are categorized based on whether they offer the continuous gameplay of real-time strategy (RTS), or the discrete phases of turn-based strategy (TBS). Often the computer is expected to emulate a strategically thinking "side" similar to that of a human player (such as directing armies and constructing buildings), or emulate the "instinctive" actions of individual units that would be too tedious for a player to administer (such as for a peasant to run away when attacked, as opposed to standing still until otherwise ordered by the player); hence there is an emphasis on artificial intelligence.